A tribute to the gallant veterans of the Emperor, the artisans of his final victory. 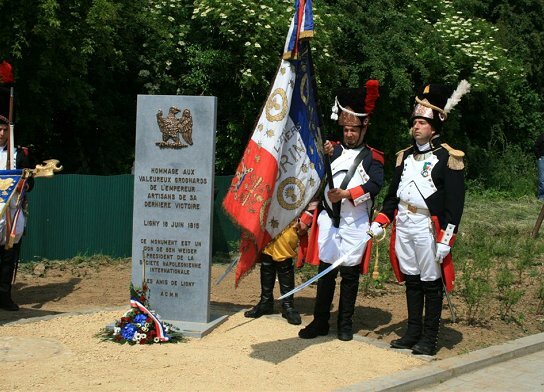 On May 30 and 31, 2009, the 45 th commemoration of the Emperor’s final victory occurred at Ligny, Belgium, on the occasion of the 194 th anniversary of that battle. Let us recall briefly the development of this battle, which occurred June 16, 1815, two days before Waterloo. Napoleon’s plan was simple: to push Blücher’s Prussians as far away as possible from Wellington’s British and Dutch lines, and then to attack these two adversaries separately. This was a classic tactic of the Emperor. On June 15, after the capture of Charleroi, Napoleon thrust forward his left wing, with Ney at its head, in the direction of Brussels. Ney’s mission was to push the British back to Quatre-Bras, from which he could then take the Prussians in reverse. Napoleon himself took command of the right wing for an attack in the region of Ligny. Yet nothing went according to plan. Ney, “the bravest of the brave,” was hesitant and tardy. In addition, there were several deplorable errors in the transmission of orders. Napoleon received no reinforcements from Ney. On the 16 th, at three in the afternoon, the Emperor gave the signal to attack: his 68,000 men were opposed by 84,000 Prussians! For more than three hours the fighting raged, with assaults and counter-assaults succeeding each other as Ligny was taken and retaken. About seven p.m., having still received no reinforcement from Ney, Napoleon had to resort to launching the Guard into the melée. The Foot Chasseurs of the Guard halted a decisive attack by Blücher. Napoleon, supported by the intensive fire of 60 cannon and by his cavalry, launched the Old Guard at the enemy center which was definitively broken. Blücher had his horse killed beneath him, and escaped miraculously from the clutches of the French cuirassiers. Defeated, the Prussians fell back on Wavre, towards the British Army. Unfortunately, given the late hour and the exhaustion caused by the intensity of combat, the French could not pursue them. The Prussians would provide vital assistance to the British two days later at Waterloo . . . Ligny thus remained the Emperor’s final victory. This year, the commemorative celebration of the final victory had two peculiarities: First, because of the elections for the European Parliament, the celebration was rescheduled for the end of May rather than the first weekend in June. In addition, it was the occasion to inaugurate a stele dedicated to the gallant veterans of the Emperor, the artisans of his final victory. This monument had been provided by Mr. Ben Weider, president of the International Napoleonic Society, with contributions from the Friends of Ligny and the Association for the Conservation of Napoleonic Monuments. Ben Weider personally developed this project, and his family completed it after his demise. The ceremonies began with a session on “Surgery during the Napoleonic Wars; a missed opportunity?” presented by Dr. Jan Bosteels. He offered a rich and moving study on this theme, illustrated by the practices of Baron Larry and of Hugh Percy. Thereafter, the Friends of Ligny provided a guided tour of the Napoleon museum. Mr. Michel Lefebvre, Secretary General of the Friends of Ligny, personally accompanied me on a detailed visit of the collection; arms and equipment from the battlefield, a First Empire drum, the trunk of a Prussian officer, and many other pieces and valuable prints, dioramas, and documents, in particular the archives of Colonel Dubois, commander of the famous Red Lancers. At the end of the tour, the various reenactment groups offered a simulation of the battle. Sunday, May 31, was the great occasion for us! The day began with a religious ceremony with a musical accompaniment, celebrated in honor of the battle casualties of Ligny. After the mass, Michel Lefebvre paid homage to Ben Weider while announcing the events of the day, including notably the procession to the monuments for the two world wars and the Bicentennial. Present in the procession were, notably, the Consul General of France in Brussels, a detachment of the French Navy led by the captain of the warship Geranium, and the bands of the Guard of Waterloo and of the 1 st Foot Chasseurs of the Imperial Guard of Ligny. I participated as spokesman for the Weider family and for the International Napoleonic Society. 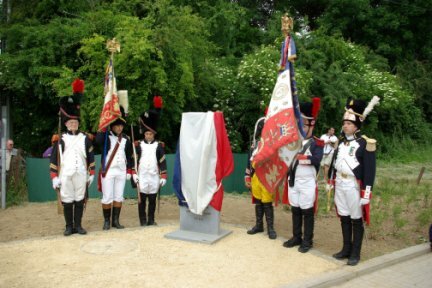 The first stages occurred on schedule with presentations of floral wreaths and military music, and we reached the monument to the victors of Ligny. 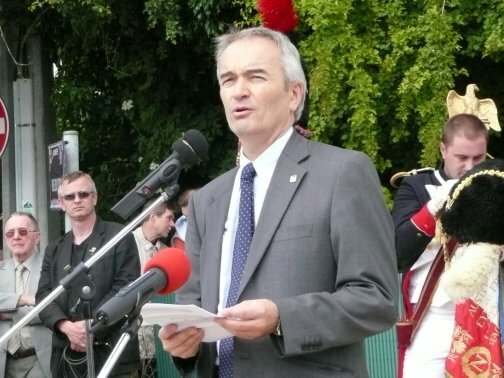 Colonel Couvreur, president of the Friends of Ligny, gave a fine speech that reviewed his relations with Ben Weider and the genesis of the monument. He also noted his status as a veteran of the Second World War. 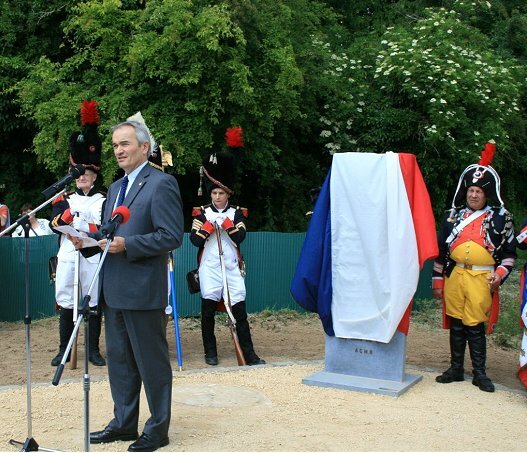 After remarks by the president of the Chamber of Commerce of Ligny, by the burgomaster and by me, the monument was unveiled before a detachment of the guard. Perfectly reflected the rich personality of the late president, of his absolute attachment to the Emperor, and of his desire to present to the historic site of Ligny a simple stele to remind the visitor or passer-by that this was the actual site of the final victory. The Friends of Ligny will always be grateful to the family which, thanks to the great promise that it fulfilled, ensured that the name of its illustrious parent will forever be embedded in the blue stone of our beautiful Walloon country. The great day ended with a banquet marking the 45 th commemoration of the final victory. The monument is unveiled by Mr. Lefèbvre & Mr. Migliorini. A reanacting group in front of the Monument. 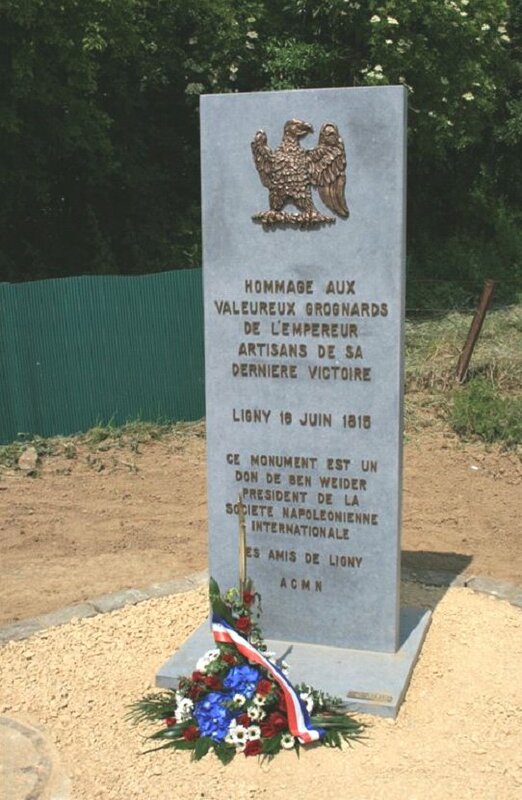 The project to erect a monument to the victors of Ligny has reached its final phase today. 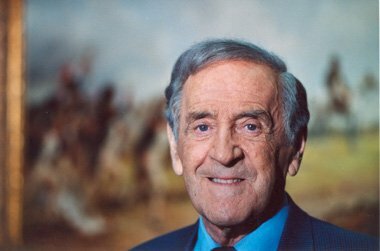 Despite the passing of the donor, Mr. Ben WEIDER, President of the International Napoleonic Society ( Canada), the inauguration took place on Sunday, May 31, 2009. The creation and installation of the monument were the responsibility of the Didier ROUSSEAU Company, located at Genval. Eric WEIDER, son of Ben WEIDER, ensured the financing of the stele. The Association for the Conservation of Napoleonic Monuments and the Friends of Ligny assisted in its completion. The Friends of Ligny thank you for being willing by your presence to enhance the inauguration of this monument, offered by Mr. Ben Weider, President of the International Napoleonic Society, with the assistance of the Friends of Ligny and of the Association for the Conservation of Napoleonic Monuments (ACMN). 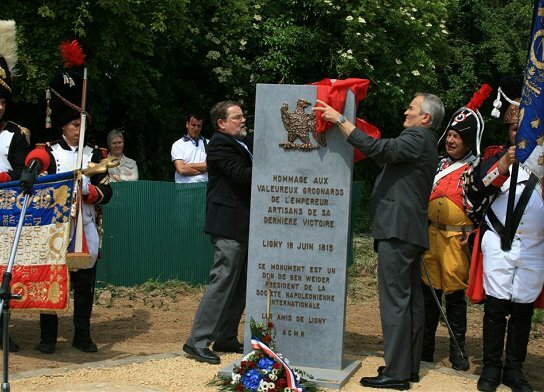 Our thanks go also to the municipality of Sombreffe and to the Walloon Region for the maintenance of the site where this monument is erected. A great thank you is also due to Mr. Eric Weider, who was determined to honor the promise of his illustrious father, who passed away prematurely, and took charge of the erection of the monument. This stele is dedicated to the valorous soldiers of the Emperor who fell here on June 16, 1815. My purpose is not to recount the story of the unforgettable battle that occurred on this heroic ground extending from Fleurus to the edge of Gembloux. Ligny was what I may call the epicenter. The losses are difficult to determine, because they vary according to the author. It is certain, however, that the Prussian losses were far greater than those of the French, which are estimated in the range of 7,000 to 12,000 men. The path that we have just followed is soaked with the blood of these brave men who gave Napoleon his final victory. That blood was their final gift offered to France. Are we to abandon these valorous troops to oblivion? Remember the motto of the French Memory, “To us, the memory; to them, the immortality.” The morning mists that invade these areas seem to carry with them the weight of sacrifice. 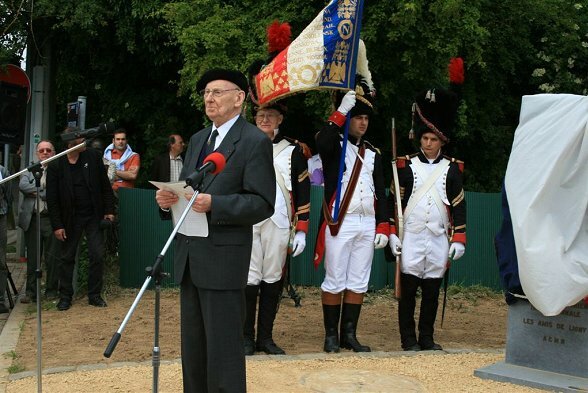 Colonel Marchand, Delegate-General of the French Memory and member of the administrative council of the Friends of Ligny, honors this ceremony with his presence, for which we thank him. Recalling my ancestors who fought the wars of the Empire, including three who died for France, and arriving at the twilight of my life, I have strongly desired that the memory of the heroes of this final victory should be inscribed in stone. To make this desire into a reality, I have been greatly supported by our administrative council and especially Mr. Michel Lefebvre, our secretary general, and Commandant Alain Arcq, our master of ceremonies and conservator of the Napoleon Museum. The Friends of Ligny, whose sole source of funds in the contributions of our members, could not support the cost by itself. I therefore thought of an uncommon personality, the epitome of a good man, an unequaled advocate for Napoleon whose generosity was equaled only by his intelligence. Moreover, he was a veteran of the last world war and we salute in him a hero of the famous landings by the Canadians at Dieppe in 1942 and in Normandy in 1944. I refer to our dear friend Ben Weider, recently deceased. He did not hesitate to lend his great support to our request, and the ACMN immediately demonstrated his desire to participate in the enterprise. This is why the name “Ben Weider” appears on this stele in the very heart of the vast ossuary of Ligny which is also at the heart of the final victory. As a Belgian officer, I am pleased to remember that numerous officers, non-commissioned officers, and soldiers of our provinces participated in this final victory of the Emperor. Two future war ministers of Belgium fought at Ligny: General Dupont was a lieutenant in the 2d Artillery and General Willmar was in the 2d Engineers. Fifteen years later, General Gerard returned to our country to help liberate Belgium from the Dutch yoke. Let us remember also General Exelmans who was an artisan not only of the final victory of the Emperor, but also of the last victory of the Empire, July 22 at Rocquencourt. Let us also give a pious thought to Marshal Lannes who, grievously wounded at the Battle of Esseling, rendering his soul to God on May 31, 1809, 200 years ago today. Ben hoped to inaugurate this stele personally, and from Heaven he is viewing this memorial ceremony, accompanied by the artisans of this victory. Thank you to the Consul General of France for the interest that you have devoted to Ligny and for the pleasure you have given us by arranging the participation of the French Navy. I appreciate the presence, thanks to the Consul General, of Lieutenant Marge Cuvier and his crew. It is with enormous pleasure that we welcome the famous red pompoms. They too are not strangers to this battle, because the sailors of the Guard fought at Ligny. Moreover, the marine fusiliers of Admiral Ronarch, alongside the 1 st Belgian Line Infantry, blocked the passage of the Yzer by the enemy on November 10, 1914, thanks to their determination. In addition, Captain, I bring the friendly greetings of retired Ship’s Captain Richard de Touchet, a member of our administrative council. Finally, once this stele is unveiled, recollect that there are eight more of the same design on the battlefield of Waterloo, created by the same master craftsman, Mr. Rousseau, under the auspices of the Franco-European Association of Waterloo whose president, and incidentally the administrator of the Friends of Ligny, Mr. Philippe de Villelongue, is also present. Let us contemplate in silence while thinking of these brave veterans who drew their last breaths on this sacred ground. I first wish to recount a personal memory. Last July, when my family and I visited Mr. Ben Weider’s home in Montreal, he told us at the end of our visit: “Next year, I have to go to Europe for the inauguration of a stele that I have financed at Ligny . . .” We discussed the possibility of meeting again in Biarritz. Alas, fate has decided otherwise. On October 17, the Napoleonic world learned with immense sadness of the loss of one of its leaders who was energetic, warm, passionate, and known to all. Today, his family is detained in Montreal by the placement of a stone atop his tomb, a ceremony long planned for this date. His family charged me, through the intermediary of Rowayda Guirguis, Mr. Ben Weider’s assistant, to represent them as well as the International Napoleonic Society. In addition, I must note that David Markham, the new president of the INS, is supervising final preparations for the 7 th International Napoleonic Congress, which will take place next week in Montreal. I have thus the honor to represent him here as well. This is the same Leon Ruquoy who rescued Ligny from oblivion! Recall that, as his assistant Rowayda Guirguis reminded me on the telephone two days ago, Ben Weider was very happy to associate his name in homage to the veterans who carried the final victory under the eyes of Napoleon himself. Let us all recall that, following Leon Ruquoy’s lead, Ben Weider’s efforts will continue to spread the knowledge of the episode of the imperial epoch that took place at Ligny. On this day of Pentecost, think of him, who is with us in spirit. Normally, I would have been with you today to act as ambassador for my friend Ben. However, for personal reasons which I have explained to Mr. Michel Lefebvre, I am unable to be present, which I deeply regret. I have therefore asked him to read this short statement in my name because, even from afar, I hope to be present in spirit. I am sad for two reasons. First, because in the eyes of a “pure” Napoleonist such as me—and for which I am frequently reproached—Ligny is a place very dear to me even if, quite evidently, I must recall the men who fought so ferociously here, among whom were Belgian soldiers and their French comrades. One cannot take lightly a place that has seen such suffering even though such sacrifice enabled the Emperor to achieve his final victory on this terrain, to be followed by another and decisive battle two days later. The ultimate outcome of this victory at Ligny confers a tragic grandeur on it. Secondly, because as representative of the International Napoleonic Society of Montreal, and even more as a personal friend of the man whose generosity enabled this monument to be erected, I should have been with you to speak of Ben. Perhaps I will have the opportunity to do so some day. Ben and I frequently discussed this monument, whose plans he sent to me to learn my opinion. He would have taken great joy to participate with you in this moment, because he was quite happy and proud to offer it both to you and to the heroes of June 16, 1815. He was so generous that he thought of it only as a tribute to recognize those who fought for and alongside the man for whom he himself fought so often: Napoleon. Apparently profiting from Ben’s passing, two notable adversaries of the poisoning thesis have just published a book in which—I read it out of duty rather than for pleasure—in their habitual manner they ridicule this thesis as crazy. Let me remind you of this struggle that Ben undertook with such perseverance to demonstrate, by the methods of science used by the greatest toxicologists, that the Emperor, deported to Saint Helena, had been poisoned by arsenic. I have in some sense become the spokesman for this struggle. The people who reject this thesis are accepted and believed. Why? That is the question to which Ben and I and all those who know the situation have never received an answer, except in the form of sarcasm and biased analyses that the media present as established fact. That is what the media are doing with the new work. By contrast, the truth is received with complete silence, and my responses have been completely censored. I felt anger mounting inside me when Mr. Lefebvre told me that one of the authors was to present a session at Waterloo to repeat his usual lies and distortions. I view this as a grave insult not only to the scientists who conducted the analyses but above all to the memory of the late founding president of the International Napoleonic Society of Montreal and his disinterested struggle for the truth. Their effort is neither elegant nor brave—I would be surprised by anything else. Deprived of its soul, the INS and its site that, according to the most recent statistics, attracts more than 270,000 visitors each month have lost their force and combat power. A highway has opened for the detractors, who can only convince those unfamiliar with the facts. Unfortunately, that describes the majority of people. On this subject, I wish to thank the Friends of Ligny most warmly in my name and, dare I say it, in Ben’s, for having the courage and elegance to refuse to associate their name with this action. Because I was very close to Ben, I know how much he loved you, and he spoke to me frequently about you. He had infinite respect for your devotion to Napoleon, for your honesty and your disinterestedness. In the eyes of a Frenchman like me, constrained to recognize with aversion all the most shameless forms of Napoleonic marketeering, you constitute a rare exception, and I use that redundancy deliberately. I want to thank not only all the friends of Ligny but most especially Colonel Couvreur whom I am happy to greet, even if only at a distance. I continue to follow his advice, and I know that, at Ligny, it will be faithfully followed. Thanks to all in the name of Ben’s memory. Ben Weider, O.C., C.St.J, C.Q., Ph.D.